“Live From Heaven” from Christian Faith Publishing author Stephen Hilsman is the story of a former news reporter who finds a new mission when he awakens in heaven. Everyone has a story to tell, especially those who have reaped the blessings of their righteous lives and passed into heaven. “Live From Heaven”: stories of the blessed souls in the sky. “Live From Heaven” is the creation of published author, Stephen Hilsman. Stephen is a newly published Christian author from a small town in Pennsylvania where he lives with his parents and two brothers. Stephen’s interest in writing began after he entered and won a scary story contest as part of his high school writing class. He has been writing ever since. In 2017, he decided to change his intended genre of writing from mystery to Christian-based fiction, thus his newfound passion was born. Stephen has also written and self-published two other works. A baptized believer in Christ, Stephen’s goal is to bring hope to the world and teach the world the importance of coming to God through his books. Published by Christian Faith Publishing, Stephen Hilsman’s new book features a unique spin on storytelling that has never been seen or heard before. When a former news reporter wakes up in Heaven, he realizes he is surrounded by millions of souls that all have a unique story to tell and important lesson to offer. As he crosses paths with more and more souls, he discovers a new calling that is so much more important than reporting the news on Earth: interviewing the spirits of the men and women who had given themselves to the Lord and found paradise among the clouds. As he begins his journey, he has the chance to hear stories of tragedy and death, along with stories of love and loss as well as stories of devotion and friendship. These spirits teach him lessons about life that are meant for the ears of the living to hear. Filled with eight heartwarming and touching stories about the importance of turning to God, “Live from Heaven” is a must-read for anyone looking for spiritual and emotional encouragement. View a synopsis of “Live From Heaven” on YouTube. Consumers can purchase “Live From Heaven” at traditional brick & mortar bookstores, or online at Amazon.com, Apple iTunes store, or Barnes and Noble. 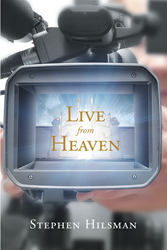 For additional information or inquiries about “Live From Heaven”, contact the Christian Faith Publishing media department at 866-554-0919.